It is a movie that hands us a hideous villain and an enormously appealing gang of young outcasts determined to erase his evil. Think of 1989 in the small town of Derry in Maine. Children have been disappearing and when Georgie, the beloved younger brother of Bill (Jaeden Lieberher) doesn’t come home, the worried boy sets out to find him. Bill gathers his fellow outcasts, a genuinely appealing group of pre-teens who share the fate of being bullied by older boys. They come together to search for Georgie on their bicycles and end up, of course, in a decrepit old house that demands bravery from anyone who enters. Doesn’t that sound like an ordinary scary movie? Yes, but since this is a Stephen King story, we can assume there is nothing ordinary about the way he scares us. The boys are confronted by the hideous clown Pennywise (Bill Skarsgaard) who will bedevil them throughout the film. We see buckets of blood, disfigurement, and terror. But this clown can’t equal what happens repeatedly as the music rolls along with increasing power telling us something awful is about to happen though it never comes when we expect it, but just exactly when we don’t. It does no good whatsoever to tell yourself it’s just a movie, close your eyes. It’s much too well done for that simple escape. As we get to know the gang of boys and Beverly (Sophia Lillis) the pretty, strong girl with a heart, we sink easily into watching them grow closer as they develop their values and their courage. Instead of being peripheral to the violence, the young actors are so good that they become the sustaining focus of the movie. For me, the clown became and interruption to watching the kids. I wanted that clown to get lost. No such luck. 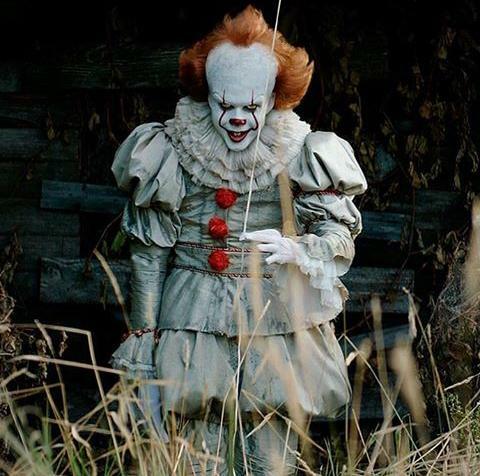 Stephen King has interwoven the boys and the clown so cleverly that there’s no way to ignore that clown as he spews blood through his ghastly teeth. He spins and leaps and uses the ugly weapons moviemakers love in our often grim time: special effects that increase the power of horror. All this is delivered flawlessly by a good cast of very young actors. Jaeden Lieberher is an appealing hero with his own vulnerabilities. Jeremy Ray Taylor’s Ben is immensely engaging because he isn’t the stuff of a standard hero. He’s a unique hero. Sophia Lillis nails her part in every way. Of the few adults in small roles, one – I won’t spoil it for you by telling you which character – is far more frightening than the clown himself. Stephen Bogaert creates a monster of a man and I am still trying to forget him. If you can stand being subject to terror delivered with unconscionable skill, this movie just might make your day. Try to see it in a multi-speaker theater so you can enjoy whirling from left to right as unexpected maxi-sounds bombard you from all sides. This review was posted on September 10, 2017, in Drama, Horror. This review was posted on April 10, 2017, in Horror, Mystery/Suspense.